Henry Redman | The PHOENIX Loyola leads the MVC for the first time since joining the conference in 2013 and its nine MVC wins are the most since winning 10 Horizon League games in 2006-07. With six games left before the conference tournament, the Missouri Valley Conference (MVC) standings are slowly starting to take shape. 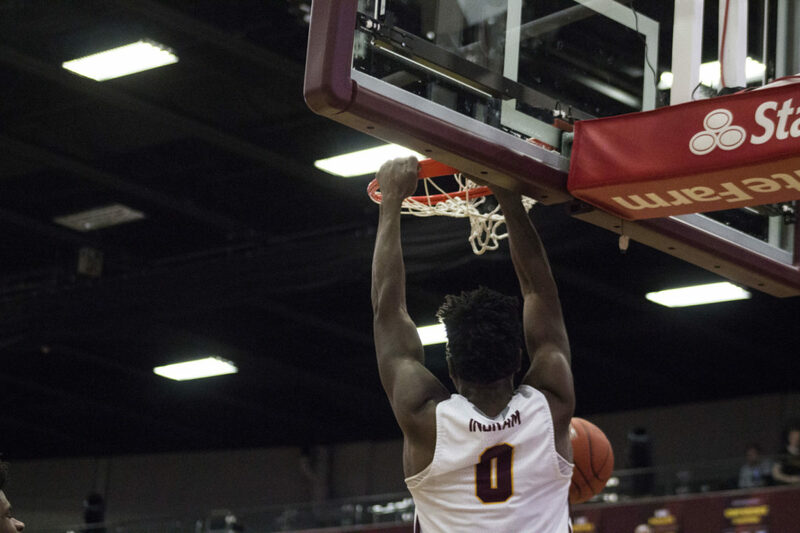 Loyola leads the way with a 9-3 record, its best since joining the MVC in 2013, followed by Southern Illinois University in second at 8-4 and three teams tied for third at 7-4. Loyola was picked to finish third behind Missouri State University and the University of Northern Iowa in the MVC preseason poll. Now, Missouri State sits tied for sixth with a 6-7 record and Northern Iowa is tied for ninth at 3-9. The Ramblers lead the nation in home field goal percentage, shooting at a 55.1 percent clip at Gentile Arena so far this season with five players averaging double-digit ppg. After six players scored in double figures against Missouri State Feb. 3, head coach Porter Moser said he’s happy with how deep his team is, so the offense doesn’t run through one player. Southern Illinois — picked to finish fifth in the preseason poll — sits in sole possession of second place at 8-4, its highest place in the standings through 12 games since 2007. The Salukis are succeeding despite losing second team preseason All-MVC senior forward Thik Bol to a knee injury before the season began. Junior center Kavion Pippen and redshirt junior forward Armon Fletcher have picked up the slack so far. Pippen, the latest MVC Newcomer of the Week and nephew of former Bulls star Scottie Pippen, is averaging 12.2 ppg and 5.8 rpg currently, while Fletcher leads the team with 14.4 ppg. Head coach Barry Hinson said while his team has had success through 12 MVC games, it isn’t enough to create separation from the three third-place teams. Bradley University, Illinois State University and Drake University sit tied for third place with a 7-5 record, with Bradley as the biggest surprise of the three. The Braves were pegged to finish seventh in the league but have seen success in the MVC this season, including a 69-67 victory over Loyola at Carver Arena Jan. 31. Only two Braves — sophomore guard Darrell Brown and senior forward Donte Thomas — averaged double-digit points so far, but their ability to score quickly has given other teams headaches all season. Despite its 14-game home winning streak coming to an end Feb. 3, head coach Brian Wardle said his team’s growth is responsible for its success. While there isn’t much separation between the teams — third place and seventh place are two games apart — the fact that Loyola and Southern Illinois have been able to jump ahead of the pack could be critical in getting a first-round bye at Arch Madness. Hinson said despite being in second place alone, things could change drastically in the next few weeks leading up to the big weekend in St. Louis. Drake and Loyola are scheduled to square off at Gentile Arena Feb. 7, while Bradley and Northern Iowa are scheduled to compete the same night. Southern Illinois and Illinois State are scheduled to play each other Feb. 8 in Normal.